The most important abiotic factors for plants are light, carbon dioxide, water, temperature, nutrients, and salinity. Their actions are interrelated in a functional network involving all major processes of plant physiology in the ecological performance of plants (Figure 3). Figure 2 Molecular regulation network in the signaling cascade from effector to active phosphorylated proteins. An effector which can be any external factor including light, that is, mainly blue and red light, or any internal factor including metabolites and phytohormones reacts with an appropriate receptor (mainly in a membrane, for example, the plasma membrane). 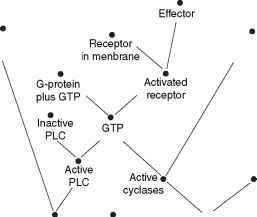 The activated receptor releases guanosine-triphosphate (GTP) from a GTB-binding so-called G-protein, which binds to and activates phospholipase C (PLC), active PLC hydrolyzes membrane-bound phosphatidyl-inositol-4,5-bisphosphate (PI-4,5-bis-P) to inositol-1,4,5-tris-phosphate (IP3) and diacyl glycerol (DAG) which elicit the release of the second messenger calcium from membrane-bound Ca2+-storing compartments, free Ca2+ ions bind to the small peptide calmodulin, and Ca2+-calmodulin activates protein kinases. GTP also can activate membrane-bound cyclases which from guanosine- and adenosine-monophosphates (GMP, AMP) form the respective cyclic derivatives cGMP and cAMP which then activate protein kinases. 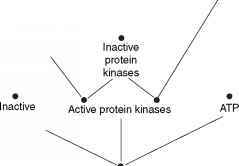 Activated protein kinases phosphorylate proteins, and the activated proteins can either directly affect metabolic processes or move into the nucleus and function as gene regulation factors. movements of stomatal guard cells, opening and closing of stomatal pores in leaves which regulate gas exchange, that is, CO2 uptake and loss of water vapor by transpiration. This affects CO2 assimilation and also tran-spirational cooling of leaves. Temperature has important effects on metabolism. Heat, cold, and freezing are important stressors. Transpiration and the xylem flow of water affect uptake and distribution of nutrients. Nutrients and light interact, for example, in the formation of sun and shade plants, where the shade plants generally have a higher demand of nitrogen. 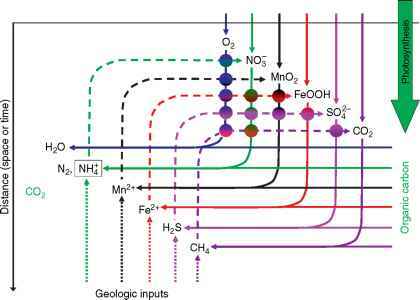 CO2 assimilation and nutrients interact in the assimilation of inorganic nitrogen and sulfur and in carbon/nitrogen signaling functions in the whole plant. Salinity is one of the outstanding ecological challenges worldwide and, in particular, is a great problem in irrigation agriculture. Salinity affects plant-water relations due to osmotic consequences and has adverse effects on ion nutrient balances, and especially the sodium ions of NaCl have adverse effects if accumulated in plant cells and not sequestered by transport across the tonoplast into the central cell vacuole. These are but a few of the possible interactions and the reader may discover others by moving around in a scheme like that of Figure 3.